A detailed introduction to these concepts and the differences between them is available on my blog. We use whole genome sequencing to study populations of bacteria that contribute to disease in Australia and developing countries. This includes in-depth studies of microevolution in specific pathogen populations (e.g. Salmonella Typhi - typhoid; Shigella sonnei - dysentery; Klebsiella pneumoniae - pneumonia, UTI and other infections), using next-generation sequencing technologies to sequence and compare the genomes of hundreds of closely related isolates of the same pathogen. In these studies, the minor differences between isolates (e.g. between Salmonella Typhi isolated from different typhoid fever patients in a particular location) are of most interest as they reveal how the pathogen is evolving in response to selective pressures (e.g. exposure to antibiotics, vaccine-induced immunity, or natural host immunity). 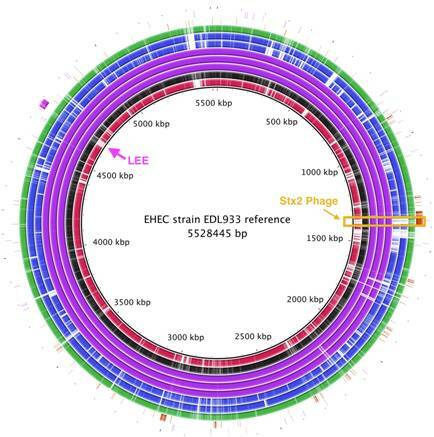 Whole genome comparisons of pathogenic E. coli strains including the 2011 German outbreak strain, compared to an enterohaemorrhagic (EHEC) strain. While some bacteria are pathogenic, meaning they make us sick, most of the bacteria we encounter are not pathogenic and live inside our bodies as commensal microorganisms. In fact, for every human cell in our bodies, there are about 10 bacterial cells. These communities of bacteria are a part of healthy human physiology and are referred to as the 'human microbiome'. We use high-throughput sequencing to profile the microbiome of the nasopharynx in cohorts of children, to see how their bacterial communities change during childhood and how the communities are related to the development of non-bacterial disease, including the severity of viral infections of the lung and the development of asthma and allergy. We are a computational lab based in the Bio21 Institute, but work closely with collaborators in other research, public health and hospital labs to develop projects and generate data. We then use a combination of phylogenetics, sequence analysis, comparative genomics, spatiotemporal analysis and epidemiological methods to analyse and interpret the data. Much of this is done using high performance computing, including Melbourne Bioinformatics at the University of Melbourne. We publish open access wherever we can, deposit all data in public databases and release open source code. For a list of microbial genomics software developed in the lab, see http://holtlab.net/software. We have recently written a beginner's guide to comparative bacterial genome analysis, which walks readers through the process of assembly and three different approaches to genome comparison. It is open access and comes with an accompanying tutorial, with step-by-step instructions using public data. Details here. Click here for the results of a PubMed search of Kathryn's publications. Click here for the results of a Google Scholar analysis of Kathryn's publications.